Sahih International The foolish among the people will say, "What has turned them away from their qiblah, which they used to face?" Say, "To Allah belongs the east and the west. He guides whom He wills to a straight path." Sahih International And thus we have made you a just community that you will be witnesses over the people and the Messenger will be a witness over you. And We did not make the qiblah which you used to face except that We might make evident who would follow the Messenger from who would turn back on his heels. And indeed, it is difficult except for those whom Allah has guided. And never would Allah have caused you to lose your faith. Indeed Allah is, to the people, Kind and Merciful. Sahih International We have certainly seen the turning of your face, [O Muhammad], toward the heaven, and We will surely turn you to a qiblah with which you will be pleased. So turn your face toward al-Masjid al-Haram. And wherever you [believers] are, turn your faces toward it [in prayer]. Indeed, those who have been given the Scripture well know that it is the truth from their Lord. And Allah is not unaware of what they do. Sahih International And if you brought to those who were given the Scripture every sign, they would not follow your qiblah. Nor will you be a follower of their qiblah. Nor would they be followers of one another's qiblah. So if you were to follow their desires after what has come to you of knowledge, indeed, you would then be among the wrongdoers. 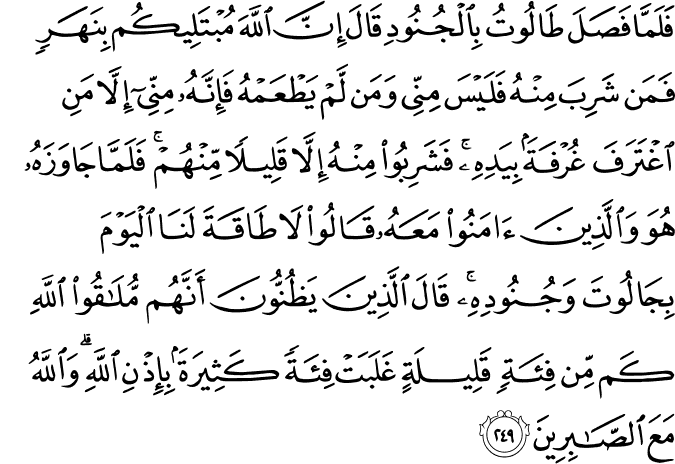 Sahih International Those to whom We gave the Scripture know him as they know their own sons. But indeed, a party of them conceal the truth while they know [it]. Sahih International The truth is from your Lord, so never be among the doubters. Sahih International For each [religious following] is a direction toward which it faces. So race to [all that is] good. Wherever you may be, Allah will bring you forth [for judgement] all together. Indeed, Allah is over all things competent. Sahih International So from wherever you go out [for prayer, O Muhammad] turn your face toward al- Masjid al-Haram, and indeed, it is the truth from your Lord. And Allah is not unaware of what you do. Sahih International And from wherever you go out [for prayer], turn your face toward al-Masjid al-Haram. And wherever you [believers] may be, turn your faces toward it in order that the people will not have any argument against you, except for those of them who commit wrong; so fear them not but fear Me. And [it is] so I may complete My favor upon you and that you may be guided. Sahih International Just as We have sent among you a messenger from yourselves reciting to you Our verses and purifying you and teaching you the Book and wisdom and teaching you that which you did not know. Sahih International So remember Me; I will remember you. And be grateful to Me and do not deny Me. Sahih International O you who have believed, seek help through patience and prayer. Indeed, Allah is with the patient. Sahih International And do not say about those who are killed in the way of Allah , "They are dead." Rather, they are alive, but you perceive [it] not. Sahih International Who, when disaster strikes them, say, "Indeed we belong to Allah , and indeed to Him we will return." Sahih International Those are the ones upon whom are blessings from their Lord and mercy. And it is those who are the [rightly] guided. Sahih International Indeed, as-Safa and al-Marwah are among the symbols of Allah . So whoever makes Hajj to the House or performs 'umrah - there is no blame upon him for walking between them. And whoever volunteers good - then indeed, Allah is appreciative and Knowing. Sahih International Except for those who repent and correct themselves and make evident [what they concealed]. Those - I will accept their repentance, and I am the Accepting of repentance, the Merciful. Sahih International And your god is one God. There is no deity [worthy of worship] except Him, the Entirely Merciful, the Especially Merciful. Sahih International Indeed, in the creation of the heavens and earth, and the alternation of the night and the day, and the [great] ships which sail through the sea with that which benefits people, and what Allah has sent down from the heavens of rain, giving life thereby to the earth after its lifelessness and dispersing therein every [kind of] moving creature, and [His] directing of the winds and the clouds controlled between the heaven and the earth are signs for a people who use reason. Sahih International And [yet], among the people are those who take other than Allah as equals [to Him]. They love them as they [should] love Allah . But those who believe are stronger in love for Allah . And if only they who have wronged would consider [that] when they see the punishment, [they will be certain] that all power belongs to Allah and that Allah is severe in punishment. Sahih International Those who followed will say, "If only we had another turn [at worldly life] so we could disassociate ourselves from them as they have disassociated themselves from us." Thus will Allah show them their deeds as regrets upon them. And they are never to emerge from the Fire. Sahih International O mankind, eat from whatever is on earth [that is] lawful and good and do not follow the footsteps of Satan. Indeed, he is to you a clear enemy. Sahih International He only orders you to evil and immorality and to say about Allah what you do not know. Sahih International And when it is said to them, "Follow what Allah has revealed," they say, "Rather, we will follow that which we found our fathers doing." Even though their fathers understood nothing, nor were they guided? Sahih International The example of those who disbelieve is like that of one who shouts at what hears nothing but calls and cries cattle or sheep - deaf, dumb and blind, so they do not understand. Sahih International O you who have believed, eat from the good things which We have provided for you and be grateful to Allah if it is [indeed] Him that you worship. Sahih International He has only forbidden to you dead animals, blood, the flesh of swine, and that which has been dedicated to other than Allah . But whoever is forced [by necessity], neither desiring [it] nor transgressing [its limit], there is no sin upon him. Indeed, Allah is Forgiving and Merciful. Sahih International Indeed, they who conceal what Allah has sent down of the Book and exchange it for a small price - those consume not into their bellies except the Fire. And Allah will not speak to them on the Day of Resurrection, nor will He purify them. And they will have a painful punishment. Sahih International Those are the ones who have exchanged guidance for error and forgiveness for punishment. How patient they are in pursuit of the Fire! Sahih International That is [deserved by them] because Allah has sent down the Book in truth. And indeed, those who differ over the Book are in extreme dissension. Sahih International Righteousness is not that you turn your faces toward the east or the west, but [true] righteousness is [in] one who believes in Allah , the Last Day, the angels, the Book, and the prophets and gives wealth, in spite of love for it, to relatives, orphans, the needy, the traveler, those who ask [for help], and for freeing slaves; [and who] establishes prayer and gives zakah; [those who] fulfill their promise when they promise; and [those who] are patient in poverty and hardship and during battle. Those are the ones who have been true, and it is those who are the righteous. Sahih International O you who have believed, prescribed for you is legal retribution for those murdered - the free for the free, the slave for the slave, and the female for the female. But whoever overlooks from his brother anything, then there should be a suitable follow-up and payment to him with good conduct. This is an alleviation from your Lord and a mercy. But whoever transgresses after that will have a painful punishment. Sahih International And there is for you in legal retribution [saving of] life, O you [people] of understanding, that you may become righteous. Sahih International Prescribed for you when death approaches [any] one of you if he leaves wealth [is that he should make] a bequest for the parents and near relatives according to what is acceptable - a duty upon the righteous. Sahih International Then whoever alters the bequest after he has heard it - the sin is only upon those who have altered it. Indeed, Allah is Hearing and Knowing. Sahih International But if one fears from the bequeather [some] error or sin and corrects that which is between them, there is no sin upon him. Indeed, Allah is Forgiving and Merciful. Sahih International [Fasting for] a limited number of days. So whoever among you is ill or on a journey [during them] - then an equal number of days [are to be made up]. And upon those who are able [to fast, but with hardship] - a ransom [as substitute] of feeding a poor person [each day]. And whoever volunteers excess - it is better for him. But to fast is best for you, if you only knew. Sahih International The month of Ramadhan [is that] in which was revealed the Qur'an, a guidance for the people and clear proofs of guidance and criterion. So whoever sights [the new moon of] the month, let him fast it; and whoever is ill or on a journey - then an equal number of other days. Allah intends for you ease and does not intend for you hardship and [wants] for you to complete the period and to glorify Allah for that [to] which He has guided you; and perhaps you will be grateful. 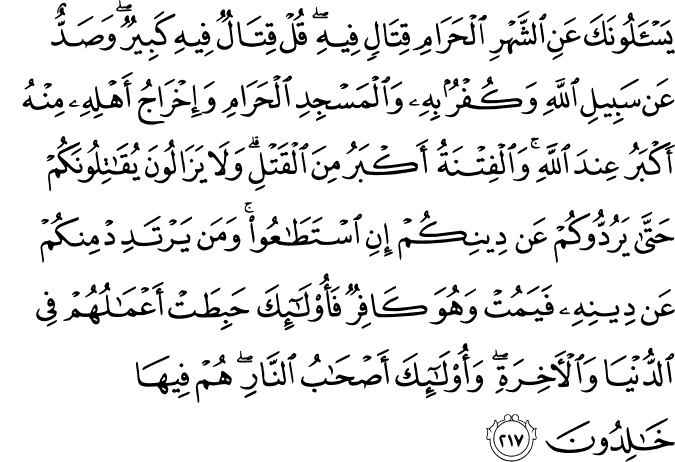 Sahih International And when My servants ask you, [O Muhammad], concerning Me - indeed I am near. I respond to the invocation of the supplicant when he calls upon Me. So let them respond to Me [by obedience] and believe in Me that they may be [rightly] guided. Sahih International It has been made permissible for you the night preceding fasting to go to your wives [for sexual relations]. They are clothing for you and you are clothing for them. Allah knows that you used to deceive yourselves, so He accepted your repentance and forgave you. So now, have relations with them and seek that which Allah has decreed for you. And eat and drink until the white thread of dawn becomes distinct to you from the black thread [of night]. Then complete the fast until the sunset. And do not have relations with them as long as you are staying for worship in the mosques. These are the limits [set by] Allah , so do not approach them. Thus does Allah make clear His ordinances to the people that they may become righteous. Sahih International And do not consume one another's wealth unjustly or send it [in bribery] to the rulers in order that [they might aid] you [to] consume a portion of the wealth of the people in sin, while you know [it is unlawful]. Sahih International They ask you, [O Muhammad], about the new moons. Say, "They are measurements of time for the people and for Hajj." And it is not righteousness to enter houses from the back, but righteousness is [in] one who fears Allah. And enter houses from their doors. And fear Allah that you may succeed. Sahih International Fight in the way of Allah those who fight you but do not transgress. Indeed. Allah does not like transgressors. Sahih International And kill them wherever you overtake them and expel them from wherever they have expelled you, and fitnah is worse than killing. And do not fight them at al-Masjid al- Haram until they fight you there. But if they fight you, then kill them. Such is the recompense of the disbelievers. Sahih International And if they cease, then indeed, Allah is Forgiving and Merciful. Sahih International Fight them until there is no [more] fitnah and [until] worship is [acknowledged to be] for Allah . But if they cease, then there is to be no aggression except against the oppressors. Sahih International [Fighting in] the sacred month is for [aggression committed in] the sacred month, and for [all] violations is legal retribution. So whoever has assaulted you, then assault him in the same way that he has assaulted you. And fear Allah and know that Allah is with those who fear Him. Sahih International And spend in the way of Allah and do not throw [yourselves] with your [own] hands into destruction [by refraining]. And do good; indeed, Allah loves the doers of good. Sahih International And complete the Hajj and 'umrah for Allah . But if you are prevented, then [offer] what can be obtained with ease of sacrificial animals. And do not shave your heads until the sacrificial animal has reached its place of slaughter. And whoever among you is ill or has an ailment of the head [making shaving necessary must offer] a ransom of fasting [three days] or charity or sacrifice. And when you are secure, then whoever performs 'umrah [during the Hajj months] followed by Hajj [offers] what can be obtained with ease of sacrificial animals. And whoever cannot find [or afford such an animal] - then a fast of three days during Hajj and of seven when you have returned [home]. Those are ten complete [days]. This is for those whose family is not in the area of al-Masjid al-Haram. And fear Allah and know that Allah is severe in penalty. Sahih International Hajj is [during] well-known months, so whoever has made Hajj obligatory upon himself therein [by entering the state of ihram], there is [to be for him] no sexual relations and no disobedience and no disputing during Hajj. And whatever good you do - Allah knows it. And take provisions, but indeed, the best provision is fear of Allah . And fear Me, O you of understanding. Sahih International There is no blame upon you for seeking bounty from your Lord [during Hajj]. But when you depart from 'Arafat, remember Allah at al- Mash'ar al-Haram. And remember Him, as He has guided you, for indeed, you were before that among those astray. 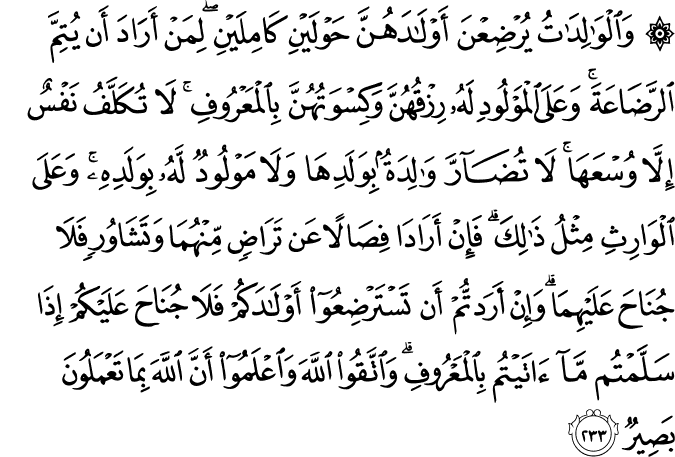 Sahih International Then depart from the place from where [all] the people depart and ask forgiveness of Allah . Indeed, Allah is Forgiving and Merciful. Sahih International And when you have completed your rites, remember Allah like your [previous] remembrance of your fathers or with [much] greater remembrance. And among the people is he who says, "Our Lord, give us in this world," and he will have in the Hereafter no share. Sahih International But among them is he who says, "Our Lord, give us in this world [that which is] good and in the Hereafter [that which is] good and protect us from the punishment of the Fire." Sahih International Those will have a share of what they have earned, and Allah is swift in account. Sahih International And remember Allah during [specific] numbered days. Then whoever hastens [his departure] in two days - there is no sin upon him; and whoever delays [until the third] - there is no sin upon him - for him who fears Allah . And fear Allah and know that unto Him you will be gathered. Sahih International And of the people is he whose speech pleases you in worldly life, and he calls Allah to witness as to what is in his heart, yet he is the fiercest of opponents. Sahih International And when he goes away, he strives throughout the land to cause corruption therein and destroy crops and animals. And Allah does not like corruption. Sahih International And when it is said to him, "Fear Allah ," pride in the sin takes hold of him. Sufficient for him is Hellfire, and how wretched is the resting place. Sahih International And of the people is he who sells himself, seeking means to the approval of Allah . And Allah is kind to [His] servants. Sahih International O you who have believed, enter into Islam completely [and perfectly] and do not follow the footsteps of Satan. Indeed, he is to you a clear enemy. Sahih International But if you deviate after clear proofs have come to you, then know that Allah is Exalted in Might and Wise. Sahih International Do they await but that Allah should come to them in covers of clouds and the angels [as well] and the matter is [then] decided? And to Allah [all] matters are returned. Sahih International Ask the Children of Israel how many a sign of evidence We have given them. And whoever exchanges the favor of Allah [for disbelief] after it has come to him - then indeed, Allah is severe in penalty. Sahih International Beautified for those who disbelieve is the life of this world, and they ridicule those who believe. But those who fear Allah are above them on the Day of Resurrection. And Allah gives provision to whom He wills without account. Sahih International Mankind was [of] one religion [before their deviation]; then Allah sent the prophets as bringers of good tidings and warners and sent down with them the Scripture in truth to judge between the people concerning that in which they differed. 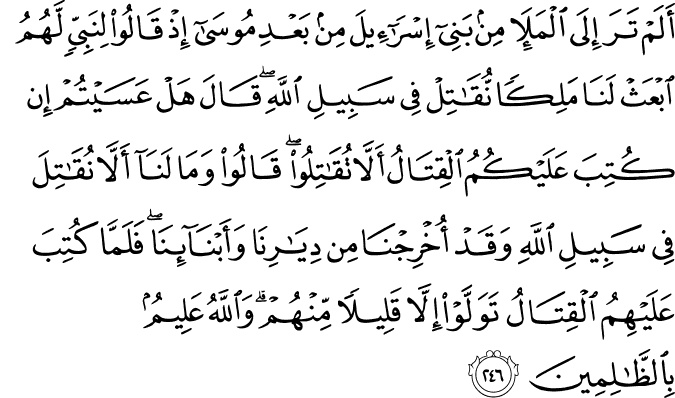 And none differed over the Scripture except those who were given it - after the clear proofs came to them - out of jealous animosity among themselves. 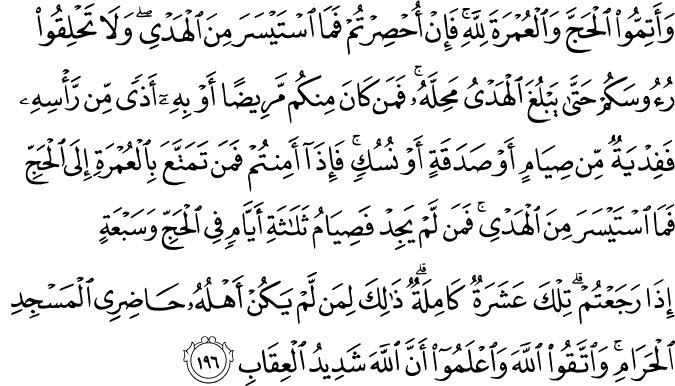 And Allah guided those who believed to the truth concerning that over which they had differed, by His permission. And Allah guides whom He wills to a straight path. Sahih International Or do you think that you will enter Paradise while such [trial] has not yet come to you as came to those who passed on before you? They were touched by poverty and hardship and were shaken until [even their] messenger and those who believed with him said,"When is the help of Allah ?" Unquestionably, the help of Allah is near. Sahih International They ask you, [O Muhammad], what they should spend. Say, "Whatever you spend of good is [to be] for parents and relatives and orphans and the needy and the traveler. And whatever you do of good - indeed, Allah is Knowing of it." Sahih International Fighting has been enjoined upon you while it is hateful to you. But perhaps you hate a thing and it is good for you; and perhaps you love a thing and it is bad for you. And Allah Knows, while you know not. Sahih International They ask you about the sacred month - about fighting therein. 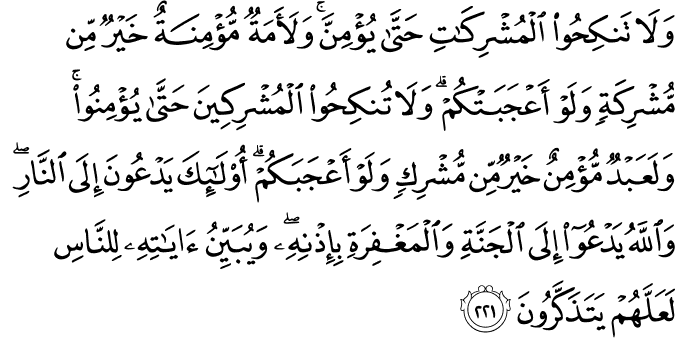 Say, "Fighting therein is great [sin], but averting [people] from the way of Allah and disbelief in Him and [preventing access to] al-Masjid al-Haram and the expulsion of its people therefrom are greater [evil] in the sight of Allah . And fitnah is greater than killing." And they will continue to fight you until they turn you back from your religion if they are able. And whoever of you reverts from his religion [to disbelief] and dies while he is a disbeliever - for those, their deeds have become worthless in this world and the Hereafter, and those are the companions of the Fire, they will abide therein eternally. Sahih International Indeed, those who have believed and those who have emigrated and fought in the cause of Allah - those expect the mercy of Allah . And Allah is Forgiving and Merciful. Sahih International They ask you about wine and gambling. Say, "In them is great sin and [yet, some] benefit for people. But their sin is greater than their benefit." And they ask you what they should spend. Say, "The excess [beyond needs]." Thus Allah makes clear to you the verses [of revelation] that you might give thought. Sahih International To this world and the Hereafter. And they ask you about orphans. Say, "Improvement for them is best. And if you mix your affairs with theirs - they are your brothers. And Allah knows the corrupter from the amender. And if Allah had willed, He could have put you in difficulty. Indeed, Allah is Exalted in Might and Wise. Sahih International And do not marry polytheistic women until they believe. And a believing slave woman is better than a polytheist, even though she might please you. And do not marry polytheistic men [to your women] until they believe. And a believing slave is better than a polytheist, even though he might please you. Those invite [you] to the Fire, but Allah invites to Paradise and to forgiveness, by His permission. And He makes clear His verses to the people that perhaps they may remember. Sahih International And they ask you about menstruation. Say, "It is harm, so keep away from wives during menstruation. And do not approach them until they are pure. And when they have purified themselves, then come to them from where Allah has ordained for you. Indeed, Allah loves those who are constantly repentant and loves those who purify themselves." Sahih International Your wives are a place of sowing of seed for you, so come to your place of cultivation however you wish and put forth [righteousness] for yourselves. And fear Allah and know that you will meet Him. And give good tidings to the believers. Sahih International And do not make [your oath by] Allah an excuse against being righteous and fearing Allah and making peace among people. And Allah is Hearing and Knowing. Sahih International Allah does not impose blame upon you for what is unintentional in your oaths, but He imposes blame upon you for what your hearts have earned. And Allah is Forgiving and Forbearing. Sahih International For those who swear not to have sexual relations with their wives is a waiting time of four months, but if they return [to normal relations] - then indeed, Allah is Forgiving and Merciful. Sahih International And if they decide on divorce - then indeed, Allah is Hearing and Knowing. Sahih International Divorced women remain in waiting for three periods, and it is not lawful for them to conceal what Allah has created in their wombs if they believe in Allah and the Last Day. And their husbands have more right to take them back in this [period] if they want reconciliation. And due to the wives is similar to what is expected of them, according to what is reasonable. But the men have a degree over them [in responsibility and authority]. And Allah is Exalted in Might and Wise. Sahih International Divorce is twice. Then, either keep [her] in an acceptable manner or release [her] with good treatment. And it is not lawful for you to take anything of what you have given them unless both fear that they will not be able to keep [within] the limits of Allah . But if you fear that they will not keep [within] the limits of Allah , then there is no blame upon either of them concerning that by which she ransoms herself. These are the limits of Allah , so do not transgress them. And whoever transgresses the limits of Allah - it is those who are the wrongdoers. Sahih International And if he has divorced her [for the third time], then she is not lawful to him afterward until [after] she marries a husband other than him. And if the latter husband divorces her [or dies], there is no blame upon the woman and her former husband for returning to each other if they think that they can keep [within] the limits of Allah . These are the limits of Allah , which He makes clear to a people who know. Sahih International And when you divorce women and they have [nearly] fulfilled their term, either retain them according to acceptable terms or release them according to acceptable terms, and do not keep them, intending harm, to transgress [against them]. And whoever does that has certainly wronged himself. 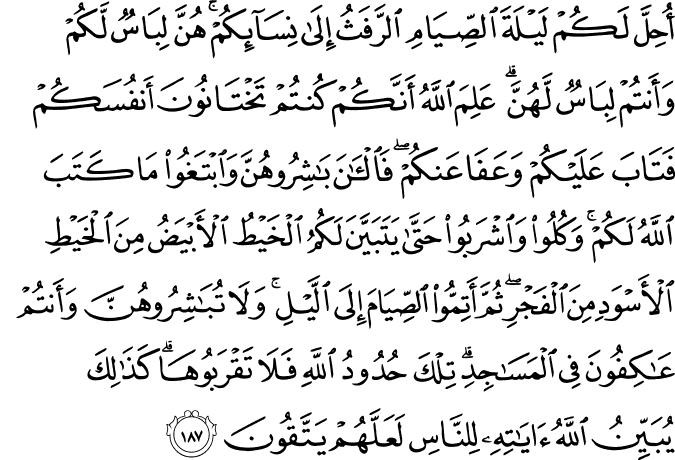 And do not take the verses of Allah in jest. And remember the favor of Allah upon you and what has been revealed to you of the Book and wisdom by which He instructs you. And fear Allah and know that Allah is Knowing of all things. Sahih International And when you divorce women and they have fulfilled their term, do not prevent them from remarrying their [former] husbands if they agree among themselves on an acceptable basis. 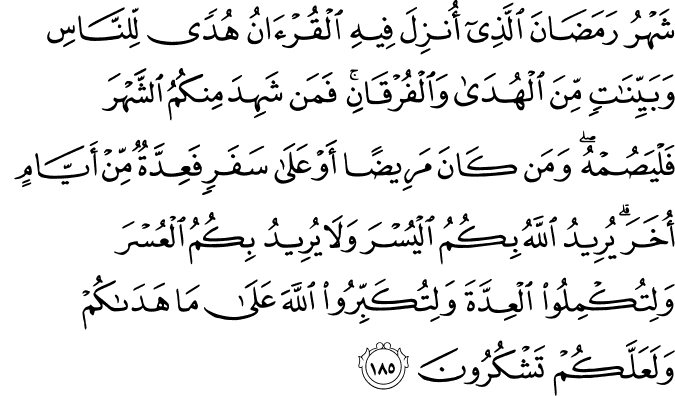 That is instructed to whoever of you believes in Allah and the Last Day. That is better for you and purer, and Allah knows and you know not. Sahih International Mothers may breastfeed their children two complete years for whoever wishes to complete the nursing [period]. Upon the father is the mothers' provision and their clothing according to what is acceptable. No person is charged with more than his capacity. No mother should be harmed through her child, and no father through his child. And upon the [father's] heir is [a duty] like that [of the father]. And if they both desire weaning through mutual consent from both of them and consultation, there is no blame upon either of them. And if you wish to have your children nursed by a substitute, there is no blame upon you as long as you give payment according to what is acceptable. And fear Allah and know that Allah is Seeing of what you do. Sahih International And those who are taken in death among you and leave wives behind - they, [the wives, shall] wait four months and ten [days]. And when they have fulfilled their term, then there is no blame upon you for what they do with themselves in an acceptable manner. And Allah is [fully] Acquainted with what you do. Sahih International There is no blame upon you for that to which you [indirectly] allude concerning a proposal to women or for what you conceal within yourselves. Allah knows that you will have them in mind. But do not promise them secretly except for saying a proper saying. And do not determine to undertake a marriage contract until the decreed period reaches its end. And know that Allah knows what is within yourselves, so beware of Him. And know that Allah is Forgiving and Forbearing. Sahih International There is no blame upon you if you divorce women you have not touched nor specified for them an obligation. But give them [a gift of] compensation - the wealthy according to his capability and the poor according to his capability - a provision according to what is acceptable, a duty upon the doers of good. Sahih International And if you divorce them before you have touched them and you have already specified for them an obligation, then [give] half of what you specified - unless they forego the right or the one in whose hand is the marriage contract foregoes it. And to forego it is nearer to righteousness. And do not forget graciousness between you. Indeed Allah , of whatever you do, is Seeing. Sahih International Maintain with care the [obligatory] prayers and [in particular] the middle prayer and stand before Allah , devoutly obedient. Sahih International And if you fear [an enemy, then pray] on foot or riding. But when you are secure, then remember Allah [in prayer], as He has taught you that which you did not [previously] know. Sahih International And those who are taken in death among you and leave wives behind - for their wives is a bequest: maintenance for one year without turning [them] out. But if they leave [of their own accord], then there is no blame upon you for what they do with themselves in an acceptable way. And Allah is Exalted in Might and Wise. Sahih International And for divorced women is a provision according to what is acceptable - a duty upon the righteous. Sahih International Thus does Allah make clear to you His verses that you might use reason. Sahih International Have you not considered those who left their homes in many thousands, fearing death? Allah said to them, "Die"; then He restored them to life. And Allah is full of bounty to the people, but most of the people do not show gratitude. Sahih International And fight in the cause of Allah and know that Allah is Hearing and Knowing. Sahih International Who is it that would loan Allah a goodly loan so He may multiply it for him many times over? And it is Allah who withholds and grants abundance, and to Him you will be returned. Sahih International Have you not considered the assembly of the Children of Israel after [the time of] Moses when they said to a prophet of theirs, "Send to us a king, and we will fight in the way of Allah "? He said, "Would you perhaps refrain from fighting if fighting was prescribed for you?" They said, "And why should we not fight in the cause of Allah when we have been driven out from our homes and from our children?" But when fighting was prescribed for them, they turned away, except for a few of them. And Allah is Knowing of the wrongdoers. Sahih International And their prophet said to them, "Indeed, Allah has sent to you Saul as a king." They said, "How can he have kingship over us while we are more worthy of kingship than him and he has not been given any measure of wealth?" He said, "Indeed, Allah has chosen him over you and has increased him abundantly in knowledge and stature. And Allah gives His sovereignty to whom He wills. And Allah is all-Encompassing [in favor] and Knowing." Sahih International And their prophet said to them, "Indeed, a sign of his kingship is that the chest will come to you in which is assurance from your Lord and a remnant of what the family of Moses and the family of Aaron had left, carried by the angels. Indeed in that is a sign for you, if you are believers." Sahih International And when Saul went forth with the soldiers, he said, "Indeed, Allah will be testing you with a river. So whoever drinks from it is not of me, and whoever does not taste it is indeed of me, excepting one who takes [from it] in the hollow of his hand." But they drank from it, except a [very] few of them. Then when he had crossed it along with those who believed with him, they said, "There is no power for us today against Goliath and his soldiers." But those who were certain that they would meet Allah said, "How many a small company has overcome a large company by permission of Allah . And Allah is with the patient." Sahih International And when they went forth to [face] Goliath and his soldiers, they said, "Our Lord, pour upon us patience and plant firmly our feet and give us victory over the disbelieving people." Sahih International So they defeated them by permission of Allah , and David killed Goliath, and Allah gave him the kingship and prophethood and taught him from that which He willed. And if it were not for Allah checking [some] people by means of others, the earth would have been corrupted, but Allah is full of bounty to the worlds. 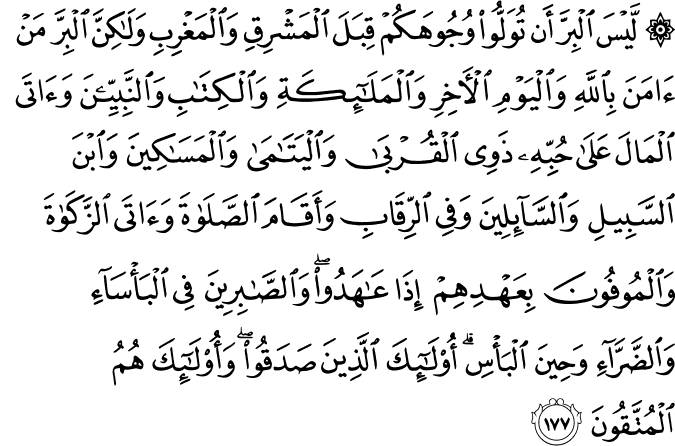 Sahih International These are the verses of Allah which We recite to you, [O Muhammad], in truth. And indeed, you are from among the messengers.